Is there any pie in which Google does not now have its fingers?! 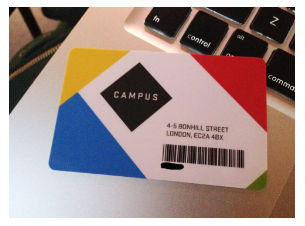 As well as all its digital activities we have now come across Google Campus Exchange. Google Campus describes itself as “a global network of spaces where big ideas are shaping the future”. Operated by Google for Entrepreneurs, it consists of premises in various locations that are dedicated to creating a thriving startup community. Google Campus London is based at Bonhill Street in EC2 and is designed to be an all-inclusive place for entrepreneurs and small businesses to network. The Campus Exchange residential programme focuses on full immersion for participants. Some previous graduates have then either progressed to programs such as Silicon Valley’s Blackbox Connect, or been nominated for the Google Play awards, or secured funding from top Angels and VCs. Applications for Google Campus Exchange are open until 22nd July and the programme begins on 22nd August. If you are interested in finding out more before applying, there are one-on-one thirty-minute sessions available with Google specialists in London, Cambridge, Liverpool, Newcastle and Edinburgh. Sessions will cover topics ranging from analytics to user onboarding, with specialists in tech, marketing, sales and data, on hand. If you are interested in the mentoring sessions or applying for Campus Exchange at Campus.co/bestofbritish. If you don’t secure a place on Campus Exchange, but still need to know how to grow your small business then do get in touch with us at Fair Business Loans! We have a great track record of helping businesses such as yours move onto the next stage of their development and would be happy to discuss your situation in more detail.